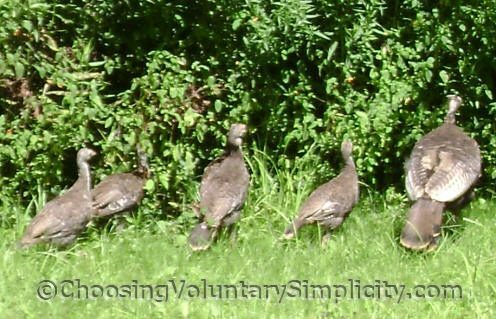 We often see wild turkeys near our house, especially in our back yard, which seems to be part of their regular route. 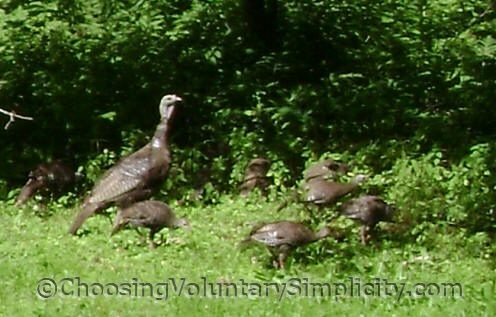 Usually they come in flocks… yesterday there were several adult female turkeys and about twenty-four half-grown babies that are now about the size of a very large pigeon. The adults cluck to the babies the same way a hen clucks to her chicks, and the babies make a soft, constant chitter as they cautiously follow the adults. Usually a large male will lead the pack and another will bring up the rear, but we couldn’t see any of the big males this time. This is so interesting. 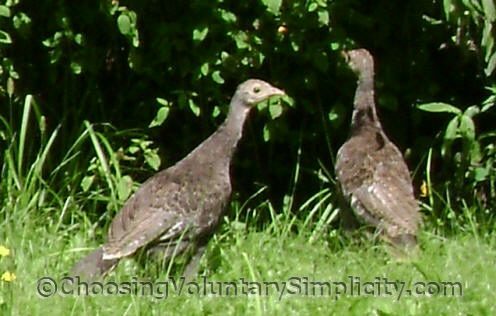 I have never seen wild turkeys before but somehow I thought they were really ugly birds. The turkeys in your pictures are beautiful! Thanks for sharing. Great pictures! I never see anything like that in my backyard. I saw a deer once about three years ago but that’s it. What is the pink flower in the second picture? It looks like something I have seen but I can’t name it. 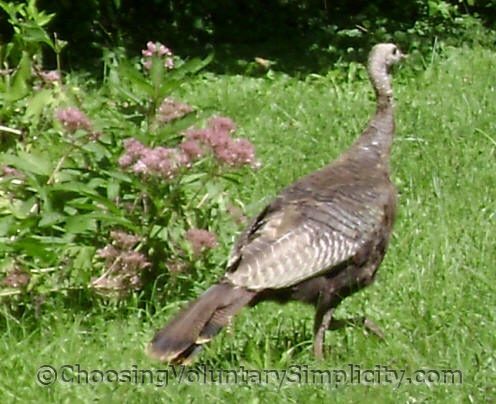 Wow I’ve never seen a wild turkey before. A wonderful set of photos. Wonderful pictures. What a delightful place you must have. Thank you! We really enjoy having the opportunity to see so much wildlife here. 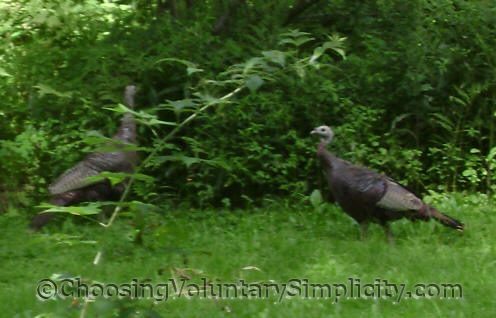 The turkeys were only introduced in this area a few years ago, but there are so many now we see them all the time. The males are huge and really impressive when they fan out their tails and stand guard over the rest of the flock. George, the pink flower in the second picture is joe pye weed. I think the turkey should be our national bird. I love eagles, don’t get me wrong, but the turkey seems more peaceful. Wow, great photos and what an interesting thing to be able to watch. I love to watch the wildlife that makes it across our backyard. We get the occasional deer, a fox or two along with the usual wildlife. Thanks for sharing these! 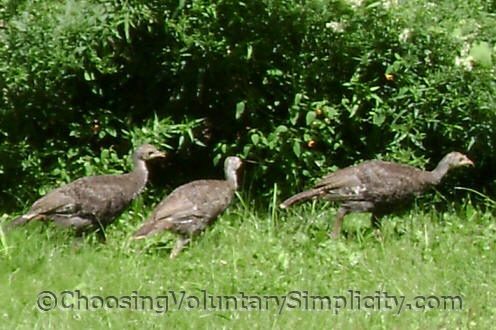 We live in Massachusetts and have turkeys stop by everyday. I throw out seed and bread, today for the 1st time ever, she brought 2 babies with her. It was so exciting to see them. Love country living, always something new to see.